I have nominated Veg and NeverSeconds for a BBC Radio 4 Food and Farming Award. I cannot think of anyone more deserving who has done more to raise awareness of food. That children deserve something better than a burgher and a can of coke. Congratulations on your nomination, Veg! I've been watching some of the Olympics too - inspiring, hard working, dedicated and such strong and motivating men and women! Have been following your blog for a few weeks now. Well done on your writing and Mary's meals. Perth on the other hand (where your guest bloggers are from) is on the other side of Australia (about 5hrs by plane) and they are much much warmer. There is a predicted top of 23deg today. It's not really a cold winter over there. Congratulations and good luck with the jabs! Congratulations on your nomination Veg! That's brilliant news! I love your blog and have really enjoyed your guest bloggers this week. 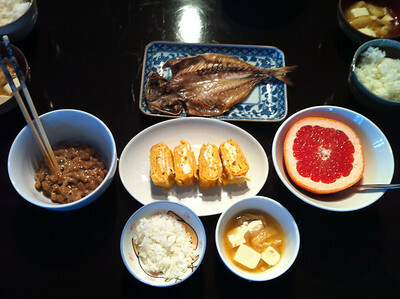 Especially Asuka's japanese breakfast. Good luck with your project. I can't wait to see a photo of your version! I watched the opening ceremony last night while chatting on facebook with two other transplanted americans that I went to Uni with. One in Canada and one in Poland (I'm in Surrey near Gatwick). We were thousands of miles apart in three different countries yet we were all watching the same program at the same time and chatting about it. It really made me aware of just how small our world has become. I'm sure you are getting excited about going to Malawi. I can't wait to hear all about your experiences there. I thought about you when I saw the delegation of athletes from Malawi. I'm sorry you missed the cauldron being lit, though, since it was done by kids this year. I had to have some "booster shots" before I started grad school. I think they hurt less the older you get, so I'm sure you'll do great. Keep up the good work, kiddo! Love you, VEG! You remind me that students aren't all close-minded and self-involved! I'm a former secondary school teacher and current college teacher--I'm going to use you as an example for my students! I'm so excited for you VEG!!!! You absolutely deserve the award. I've got my fingers crossed for you to be the winner! i am proud of you.. the god will give u good health and wealth for the whole life.. keep rocking.. whole world will support you. Congratulations VEG for your nomination for the Great Scot Award !!! Great blog last week, and so looking forward to the coming weeks. I heartily second all WDV has said! So delightful to read about how people can help each other no matter how old they are - and have others help, too! It's a pleasure to have you on the helm, taking us to safe havens. I've loved reading your blog. Entertaining, funny, and just plain interesting. Above all that you have raised a fantastic amount of money for the charity, Mary's Meals. You are a true inspiration to children and adults around the world. How wonderful to hear that you have been nominated for the Great Scot Award. A well deserved nomination, and I wish you the very best of luck with that. congrats to Martha and her family! outstanding! well deserved! woohooo! I am glad to receive very nice & warm comments from many people and very happy that you will try out the Japanese breakfast for your family. Look forward to seeing your masterpiece! All will go well - just bear in mind to keep the cooker in lower end while cooking omelette so that it won't burn! Congratulations on your nomination mo chara! Well deserved! I really hope you get it. You're a true inspiration and I've been telling everybody about you. Keep going. And you deserve it. 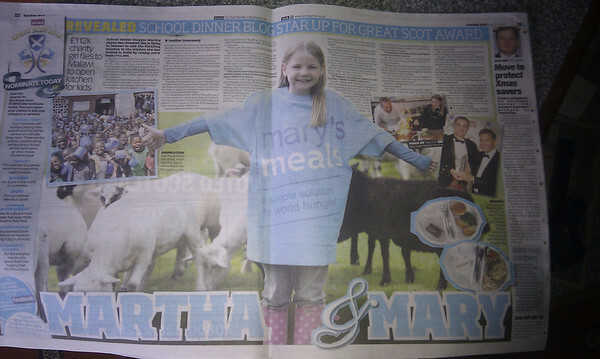 I have nominated Martha and NeverSeconds for the BBC Food and Farming Awards, have you?